Kotobukiya's Marvel Comics ARTFX+ series has brought you a range of characters. from the Avengers to the X-Men. Defenders. and more. with stunning detail in 1/10 scale. Now the spotlight returns to Earth's Mightiest Heroes with a new series of Avengers characters based on designs by Marvel superstar artist Adi Granov. The next character to join the lineup of heroes is the supervillain Thanos! Even at 1/10 scale. the Titan stands a massive 28 cm (11 inches) tall. looming behind the Avengers assembled in front of him in the original concept art. 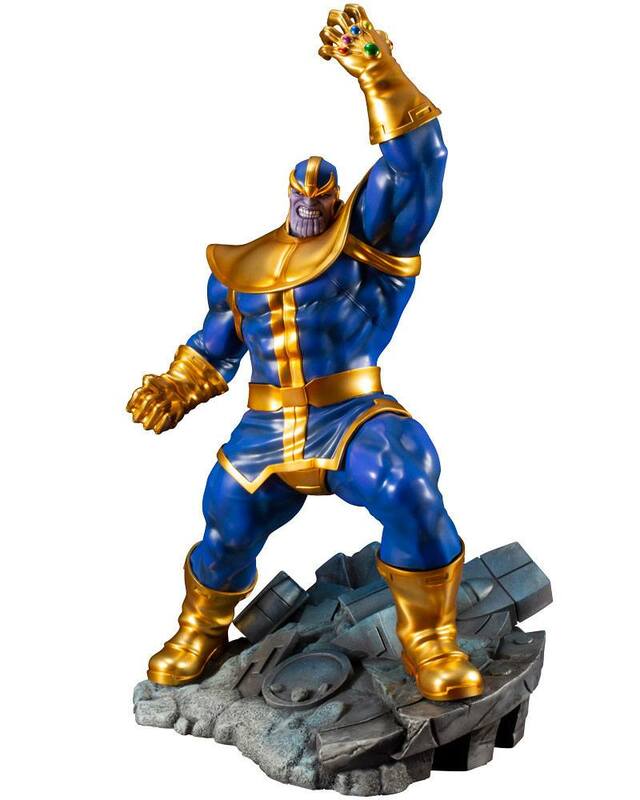 Thanos brandishes his Infinity Gauntlet with the five Infinity Stones in an ominous pose. threatening all who dare to stand in his way. Portrayed in a bold blue and gold costume inspired by the classic comics. this easy-to-assemble snap-fit piece looks great straight out of the box. and the statue's dynamic sculpting and paint job exude a powerful energy that is sure to reign supreme over your collection!